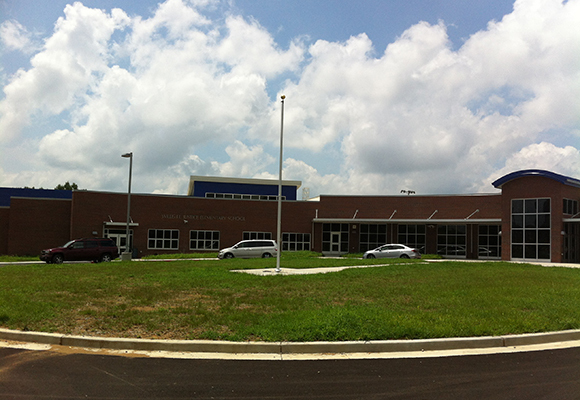 The site was restricted due to two existing schools being located on the property and required development in three phases to construct the new school while leaving the current elementary school open. Demolition on site was designed and coordinated in two phases, and utility services were maintained or temporary services provided to keep the existing school operational. The grading for the school was complex because it has three separate finished floor elevations, with existing grades being up to 13 feet from street entrances to the building. Multiple handicap ramps were designed to maintain ADA-compliant sidewalks from the parking lots, the existing school, and the new school. Palmer also provided detention pond design and utilities including water, sanitary sewer, and coordinated telephone and electric services to the building.